The work at the Funk Motor show at Peveto Gallery (2627 Colquitt) is continuing through August and is completely worth a visit. Art by Brian Boyter. 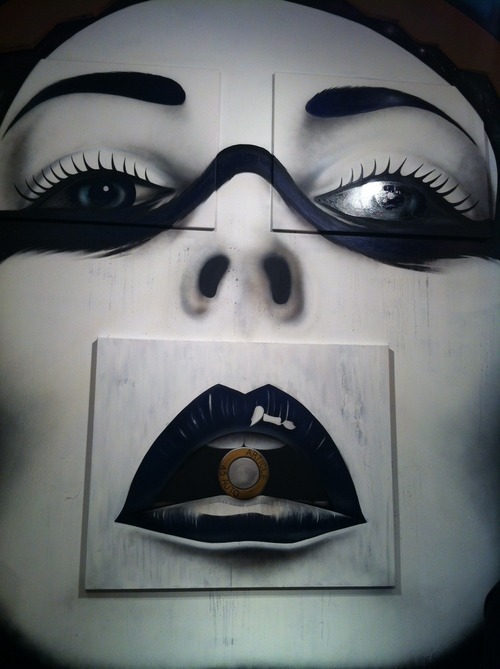 Above is a canvas which is for sale, below is painted directly onto the wall. 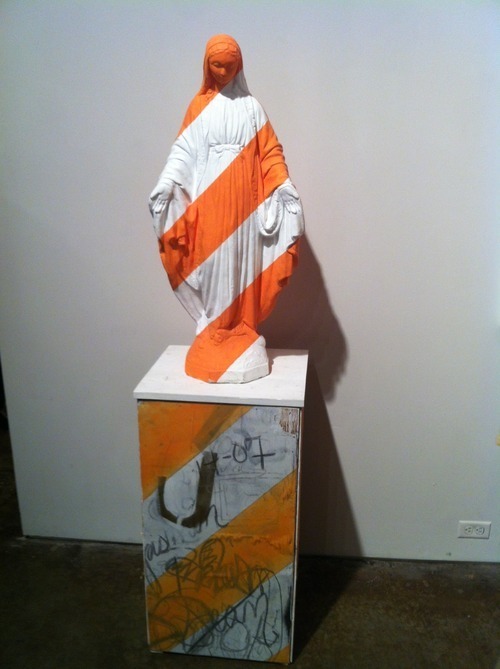 FURM paints a religious symbol, thought of as a symbol of love and forgiveness with roadway WARNING colors shaking up our ideas and making us look at ordinary objects in a new way in his piece entitled Madonna. 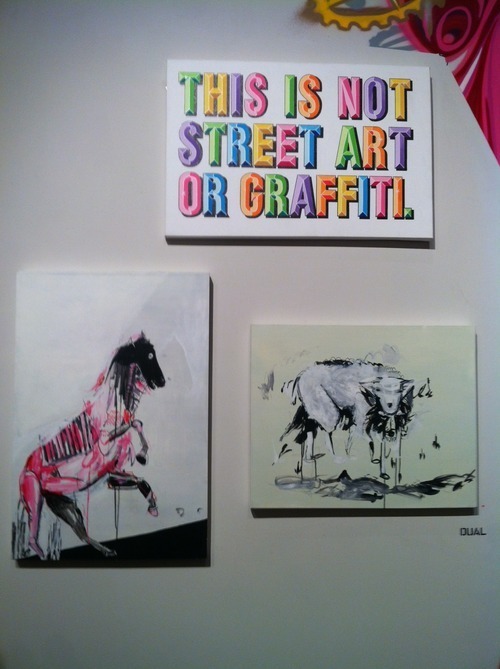 DUAL a respected street artist, muralist and artist in his own right continues to push forward new styles and colors with his painterly animal sketch style paintings and graphic design lettering in neon entitled; This Is Not Street Art or Graffiti questioning how we define art. The show is coordinated by Noah R. Quiles from Up Art Studios and in holding on to the street art that Mr. Quiles often represents he offered artists the opportunity to paint the surrounding walls. Several artists used the walls to showcases canvases that could be sold in a group or as separate entities. 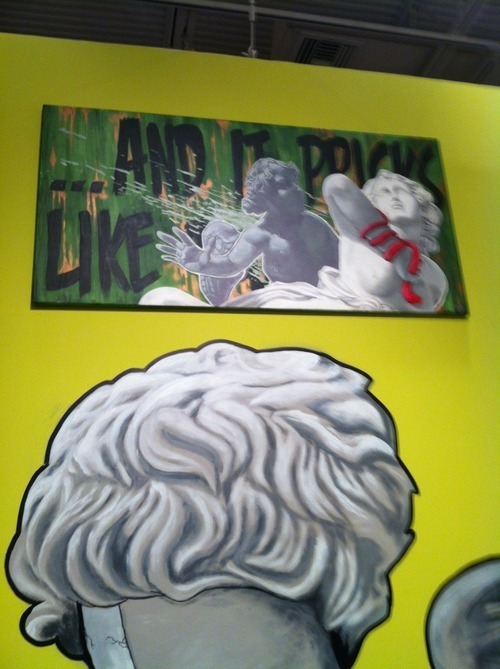 The piece above, Kiss of Death is painted directly on the wall. The right eye, left eye and mouth are each sold as separate paintings by Article.